De La Soul’s free downloads: The band’s long, complicated copyright tangle. Is De La Soul’s long fight to release its music digitally finally over—or just beginning? 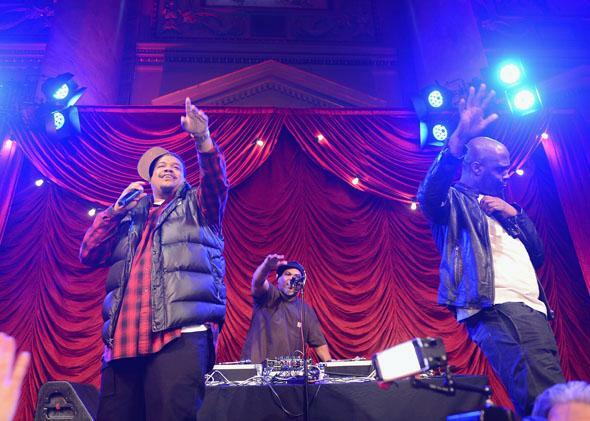 De La Soul performs in 2013 in New York City. On Valentine’s Day, De La Soul released most of their back catalog for free. Fans rejoiced at the unexpected gift, which included the albums 3 Feet High and Rising (1989), De La Soul Is Dead (1991), Buhloone Mind State (1993), and Stakes Is High (1996) and dozens of rare remixes, B-sides, and instrumentals. The move generated huge amounts of buzz and goodwill, judging by the outpouring of affection on Facebook, Twitter, and around the Web. It will help, no doubt, with the tour they just announced, on the eve of their 25th anniversary as a group. “I think it’s probably one of the ballsiest moves that has ever been made in the history of the hip-hop business,” says hip-hop historian Jeff Chang, author of the book Can’t Stop Won’t Stop. Fans were particularly hungry for this music. For many years, De La Soul has been sidelined by their inability to make their work available for sale digitally. With the exception of The Grind Date, released in 2004, and a few scattered newer releases, most of the group’s back catalog wasn’t readily available. You can find their albums on vinyl and CD, but you can’t buy the MP3s. Why couldn’t De La Soul reissue their albums in MP3 format and make them available for a fair price on iTunes? As many of its fans know, the group has a tangled history with sampling and copyright law; a post last week by the advocacy group the Future of Music Coalition offered a useful primer on the situation. De La Soul’s first three albums were classics of hip-hop’s sampladelic golden age—a time when artists sampled liberally and were more cavalier about securing (or not securing) permission to use those samples. An interesting, if confusing, twist in De La Soul’s story is that their label at the time, Tommy Boy, did clear the samples (or at least the ones they knew about) when the albums were originally released. That’s according to Tommy Boy label boss Tom Silverman, in the documentary Copyright Criminals and the book Creative License, by University of Iowa communications professor Kembrew McLeod and Northwestern law professor Peter DiCola. “It’s a lot of accounting work,” Silverman told McLeod and DiCola, discussing the early De La Soul albums. “You have to pay out on 60 different people on one album. It’s quite a nightmare actually.” There was, however, an infamous sample the label did not clear, from a band called the Turtles, who were sampled on 3 Feet High and Rising. De La Soul and their producer, Prince Paul, used a sample from the Turtles song “You Showed Me” in the skit “Transmitting Live from Mars,” layering the dulcet psychedelic tones under an instructional French-language record. In 1991, the Turtles sued the group for copyright infringement. According to McLeod and DiCola’s book, the case was settled out of court for an amount said to be $1.7 million, though the members of De La Soul have said the amount actually paid out was less than that. As badly as the group, and its fans, would like to see the music available, it would take effort for Warner to make it possible. Releasing De La Soul’s music digitally would require spending the time and money to make sure there aren’t other samples that weren’t cleared initially, like the Turtles song, and whether there are agreements that would need to be renegotiated. A single De La Soul album could have a few hundred samples, all of which needed to be licensed and would need to be scrutinized. If Tommy Boy cleared the samples originally, what’s the holdup now? A lot has changed since 3 Feet High and Rising came out 25 years ago. “First off, the phrase ‘clearing samples’ is in and of itself ambiguous,” says Howard King, an entertainment lawyer in Los Angeles who represents Metallica, RZA, Dr. Dre, Robin Thicke, and many other major artists. “Because it really depends on for what uses they cleared them. Clearing samples 25 years ago—nobody really thought about digital.” Contracts written in 1989 to “clear” samples for recordings on vinyl, cassettes, and CDs may not cover digital use—the MP3 didn’t exist back then. Online stores like iTunes tend to be circumspect about carrying music that might have copyright issues. Sample-heavy albums can be ticking time bombs, says McLeod. “As long as you keep selling them or [are] keeping them available, you are the potential target of a copyright infringement lawsuit,” McLeod says. “Someone can always pop out of the woodwork and sue today. That’s one reason why De La Soul’s albums, and also Public Enemy and other classic golden-age groups, have had a lot of difficulty being made available on legit online stores.” The Knack, for instance, emerged 20 years later, in 2006, to sue Run-DMC for sampling “My Sharona” in their 1986 tune “It’s Tricky.” They also named Amazon, iTunes, Yahoo, and Napster in the lawsuit. 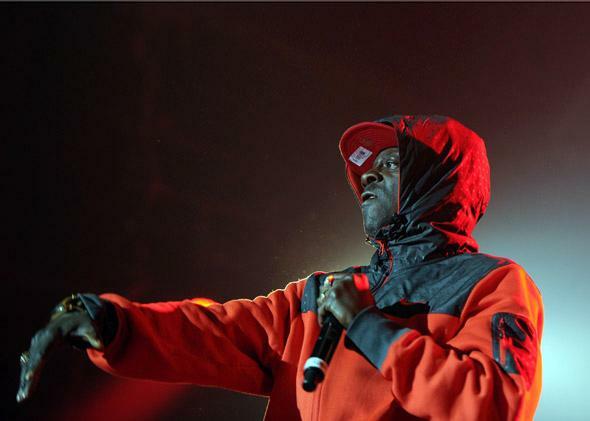 Public Enemy performs in Bourges, France, in 2013. Public Enemy, whose great early albums were released on Def Jam, which is now owned by Universal, seems to have resolved its copyright issues for now; you can currently buy the group’s classic albums on iTunes and other sites. It was a long, hard road to get there; Public Enemy faced a similarly tricky situation with sampling. “ ‘Fight the Power’ has, like, 17 samples in the first 10 seconds,” Public Enemy’s Chuck D told journalist Mark Dery in 1990, estimating that there were “about 150, maybe 200” samples on Fear of a Black Planet alone. Chuck D has long been a savvy proponent of digital distribution, starting his own company, SpitDigital, to help groups get onto online stores. But in general, McLeod says, it’s easier for iTunes and other online stores to sell classic rock than it is to deal with the legal hassles of selling classic hip-hop albums. In an interesting wrinkle to the story of De La Soul’s Valentine’s Day present to its fans, several tech news sites such as Recode and The Verge reported that the albums in De La Soul’s free giveaway may have been downloaded illegally: Metadata on some of the albums revealed the URL of the Russian pirate site Rappalata. If the albums were indeed pirated, it might read as a political statement, driving home the fact that the band doesn’t own their master tapes. It may also be an acerbic joke from a group that specialized in them. “Given De La Soul’s sense of humor, I think it would be entirely possible that it’s an inside joke, a meta-commentary on the craziness that is today’s music industry, when they can’t even make their own music available through legitimate channels,” says McLeod. Another way to reach a new generation of listeners is through a lavish anniversary rerelease of an iconic album. Rhino Records, under the Warner umbrella, did a nice vinyl reissue of 3 Feet High and Rising last year. Universal is currently in the process of reissuing several hip-hop albums in its “Respect the Classics” series, including Public Enemy’s It Takes a Nation of Millions to Hold Us Back. Some will be expanded reissues, but many of the releases are faithful replicas of the original material. McLeod points to the Beastie Boys’ Paul’s Boutique 20th anniversary edition, released by Capitol in 2009, which didn’t have any bonus tracks. “The reason why Public Enemy, the Beastie Boys, and De La Soul haven’t been able to release reissues of expanded albums is because once they re-release an altered version of the actual album they have to relicense from all the sample holders, which is totally crazy,” McLeod says.